"Prime Rhythms / Piano No. 1 is a sound sculpture built and composed by Grant in response to the paintings of James Hugonin. Shown as part of Hugonin's most recent exhibition, Binary Rhythm: Paintings 2010 - 2015, the work uses a reconditioned piano with a purpose built mechanism that incorporates prime numbers to inform a score. The music reflects the timbre and musicality of Hugonin’s work while the prime numbers - expressed as teeth on a series of cogs - explore the deterministic nature of systems as a juxtaposition to the artist’s expression." I think that's rather pleasant musically actually, as well as fascinating visually. "The Dato DUO is a synthesiser and sequencer designed for two to people to play at the same time – and requires little musical talent to use. The perfect instrument for two synth nerds on a first date, it has two oscillators, one pulse and one sawtooth; an eight-step sequencer; pentatonic keyboard; various outputs and inputs (for guitar pedals and other equipment); and, just as importantly, it looks like the most pleasing toy you never got for Christmas." "The ‘Santa Melodica Orchestra’ is a sound performance for twenty-five performers, melodicas, cable tubes and balloons. While playing, each performer swings their instrument at a certain speed. Together they create an arpeggio effect, that constantly changes due shifts in speed, turning the performers into a continually transforming kinetic organism"
Now as a sound designer myself, I really like this one - I only wish we could all experience its moving spatial aspect! Too bad the video isn't 360 visual and audio. That would be fun! "Ken Butler is a Brooklyn-based artist and musician who has built over 400 musical instruments. But these aren't just any custom-built instruments. Butler builds his pieces from discarded items he finds on the streets of New York City. Hockey sticks, tennis rackets, brooms, golf clubs, pieces of furniture, styrofoam, toothbrushes: all are fair game for his masterpieces. It's musique concrète... jungle." I love the viola-case cello, it's a bit meta! 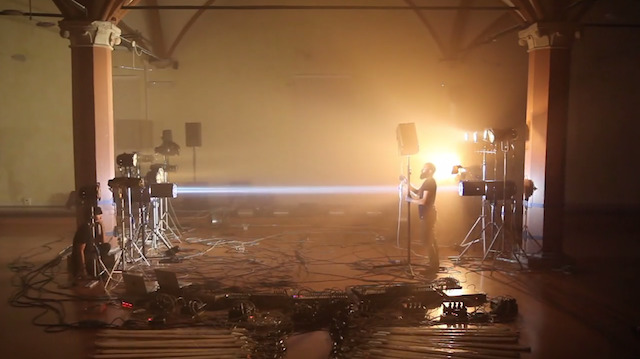 Italian sound designers Fabio Di Salvo and Bernardo Vercelli of The Quiet Ensemble, presnet a concert by an orchestra of 96 high-powered strobes, headlights, and neon lamps. "Each lamp in Salvo and Vercelli’s 96-light orchestra was fitted with its own copper coil, allowing it to receive various electrical currents at programmed intervals. The electromagnetic fields they produced were then captured by a sensor, also attached to each lamp, which turned currents into sounds." "But the electrical buzz alone was not quite worthy of a symphonic performance—this is where Salvo and Vercelli entered the scene. Moving seamlessly between each of their makeshift orchestra members, the artists modified and amplified each lamp’s electric emissions in real time. Through these helping human hands, each burst of sunburnt light and every blurry ray of bluish electricity was transformed into The Enlightenment’s rhythmic, robotic symphony." It certainly looks good when played live! Why do I suspect it might not sound quite like that if I was behind it? I love the simplicity of the interface though - looks like it would be easy* to replicate as a VST instrument? * Not easy for me! Easy for someone clever. A performance piece for 8 participants: a string quartet and BCMI quartet. BCMI stands for Brain Computer Music Interface. The BCMI quartet involves four persons wearing a brain cap furnished with electrodes to read information from the brain of 4 persons. During the performance, the BCMI quartet generates musical scores to be performed by the string quartet in real-time: each member of the BCMI quartet generates an individual part for a musician of the string quartet. It's a very techy way to create generative music! Though I don't see the difference between using electrodes and a mouse! Here's something a little different! "Inspired by the landscape of Prior Park, Sound UK have challenged adventure play company TouchWood to make a group of ‘woodland instruments’. Nestled within Prior Park grounds the musical playground is for you to discover, explore and play." The funny thing is I've played several times in Prior Park over the years but never on those instruments. (The Bath City Waits, with whom I play, have played in a few open air concerts there). It's a lovely place to visit and now with added instruments! "Brunettes Shoot Blondes designed a unique music instrument packed with a whole orchestra to perform their new song “Houston” live. The band brought a broken, vintage grand piano to life, by reengineering it into a hybrid, containing 20 instruments in it. The musicians came up with an idea of making a true analog apparatus which could play different instruments nested inside the rim just by playing the keys. So when pressing a key, the piano hammers beat a marimba, tambourine, cymbals or even castanets. There are also special mechanical devices that allow for the playing of cello, violins and organ." I was just about to post this! Though I found it via https://www.thisiscolossal.com - which is always worth a few minutes of your time.